midas Design can design it based on the latest ACI code and produce the AutoCAD drawings for the same. 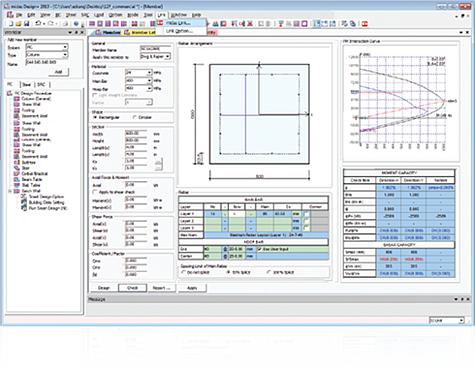 Its simple GUI eases the process of input of loads and design parameters thus making it a perfect software for structural and peripheral design. 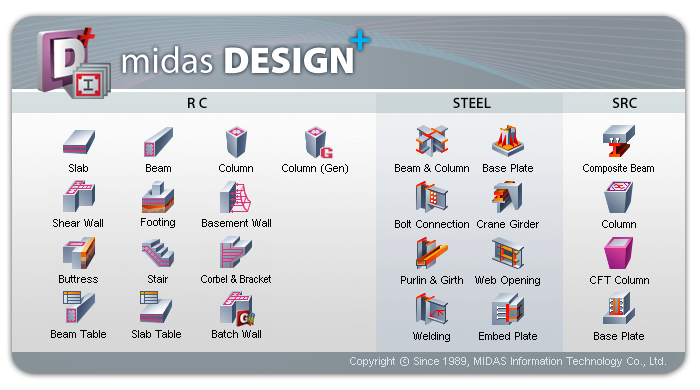 midas Design has been created to simplify the input required from the engineer and the input is in the sheet format widely used by the engineers. The parameters can be defined from the excel directly by copy and paste. The diagrams are provided with the parameters input so as to make it more intuitive. 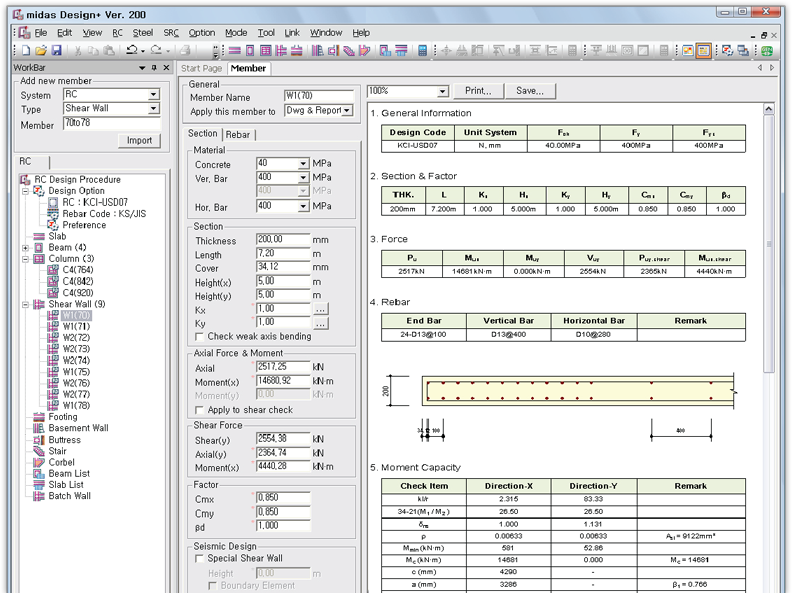 These parameters can be modified at any point during the design process. midas Design has been equipped with a smart solver and the easy GUI makes it efficient, the calculations are almost instantaneously done. 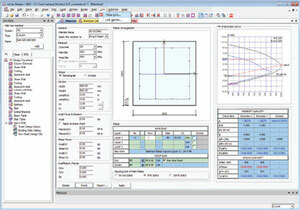 This allows for the optimized design, many sections can be defined at the same time and the optimum of them can be selected based on the bill of material given automatically from the program. 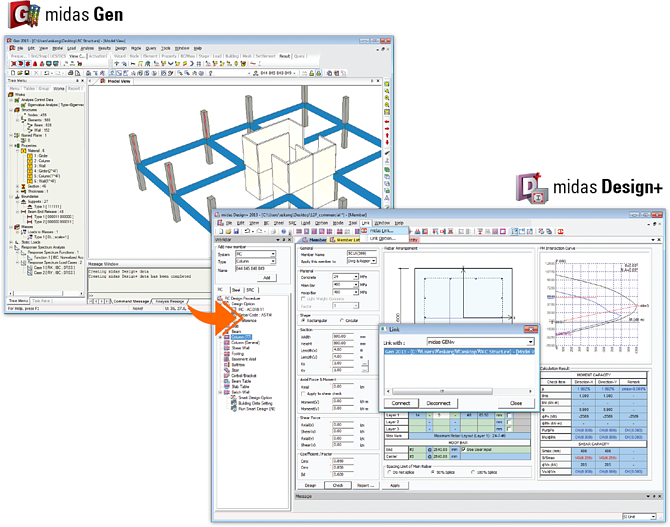 and midas Design can import the section parameters and the load combinations from the midas Gen analyzed model. 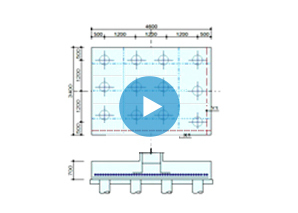 This allows for the quick design/checking of the sections after analysis in midas Gen.
Also, if the section shape needs to be revised, it can be sent back from midas Design to midas Gen.
midas Design+ combines the design and drawing generation for all the members be it a beam, column, slab or staircase, midas Design+ can design it based on the latest ACI code and produce the AutoCAD drawings for the same. 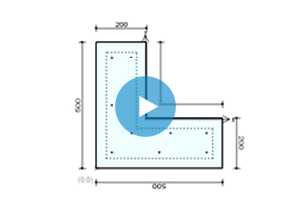 Its simple GUI eases the process of input of loads and design parameters thus making it a perfect software for structural and peripheral design. midas Design+ is developed to be simple, fast and accurate. It provides: intuitive graphic interface for efficient design work; seamlessly integratrd with midas Gen; auto drafting & editing functionality. 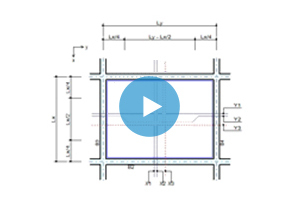 midas Design+ consists of a range of software modules for structural engineers to streamline the process of design and detailing into one design operation. The product range includes RC design, Steel Design, SRC Design and Code Design according to ACI, AISC-LRFD and Eurocode.